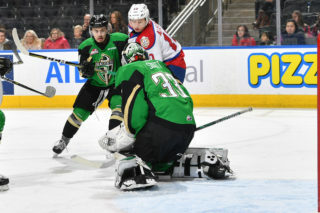 Four first period goals proved to be the difference maker for the Edmonton Oil Kings (3-2), who defeated the Medicine Hat Tigers (2-3), 5-4, in front of 6,335 fans at Rogers Place in Game 5 action on Friday night. 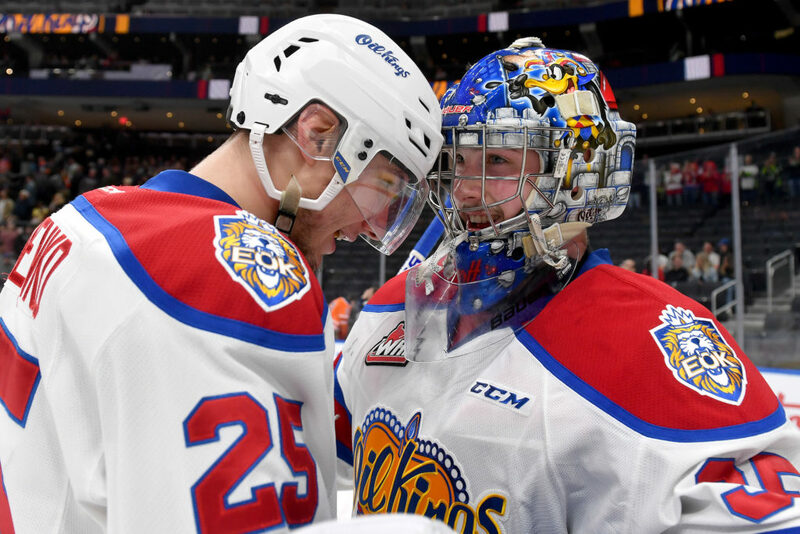 The Oil Kings now take their first lead of the best-of-seven Eastern Conference Quarter-Final playoff series, 3-2, with a chance to clinch in Game 6 this Sunday, March 31 at 6:00 PM MT in Medicine Hat. Not only did they pile on the goals in the first period, but they started early – just 16 seconds into the game to be exact – and skated out of the frame with a 4-1 edge. But the win wasn’t a cake walk for the Oil Kings by any stretch, as the Tigers cut the lead in half to 4-2, then climbed back from 5-2 to make things interesting in the third period. Todd Scott (2-0) got the start for the second straight night and earned the third win of the post-season for Edmonton, making 27 saves on 31 shots. Mads Sogaard (2-3) was saddled with the loss, tonight seeing 39 shots by the Oil Kings, allowing five. 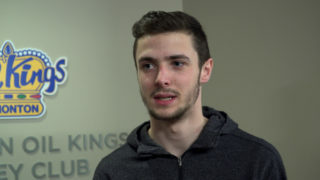 It was a First Star performance from captain Trey Fix-Wolansky who enjoyed his first two goals of the playoffs, which included the eventual game winning goal. Andrew Fyten, Scott Atkinson and Andrei Pavlenko (1G, 1A) were the other goal scorers for the home side, while Wyatt McLeod, Vince Loschiavo and Vladimir Alistrov each tallied multi-point nights with a pair of assists. 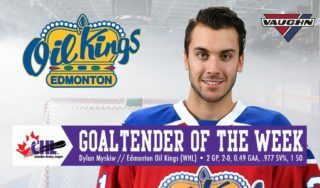 It only took 16 seconds for the Oil Kings to get on the board, as Pavlenko notched his first of the playoffs, from Alistrov and McLeod at give Edmonton an early 1-0 edge. 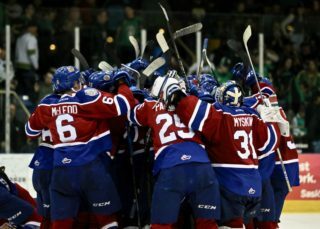 But just 28 seconds after the goal the Oil Kings were whistled for boarding, and five seconds into the penalty the Tigers capitalized, making it a 1-1 game just 23 seconds after the Pavlenko goal. The Oil Kings continued to pour it on though, regaining their lead at 5:08 via Fyten’s second of the postseason, assisted by David Kope and Jake Neighbours to make it 2-1. Just shy of the eight-minute mark Fix-Wolansky danced around a Medicine Hat defender and buried a beauty for his first of the playoffs, from Loschiavo and McLeod, to increase the Oil Kings lead to 3-1 at 7:57. 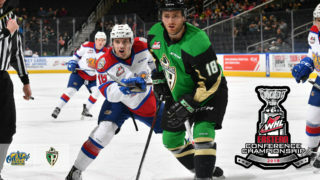 Before the period was out the hosts struck again as Atkinson tallied his first of the postseason, from Alistrov and Pavlenko, to round out first period scoring at 18:49 with the Oil Kings leading 4-1. Shots on goal through the opening 20 minutes of play once again heavily favoured Edmonton, 18-8. The Tigers cut the lead in half, 4-2, with an early goal of their own just 41 seconds into the second period. It was one of two goals scored in the middle frame, the other belonging to Fix-Wolansky – his second of the night – on a feed from Quinn Benjafield and a hard-working battle along the boards by Loschiavo at 12:31 to make it 5-2, Edmonton. Shots on goal after 40 minutes were 33-18, Oil Kings. Near the midway point of the third period the Tigers began to bite back, creeping closer with a goal at 8:12 to cut the lead to 5-3, then adding another just 2:10 later at 11:22 to make it a one-goal game, 5-4. 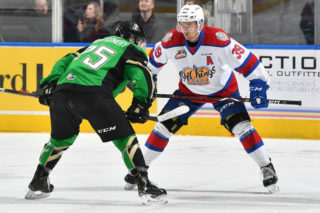 The Oil Kings were whistled for back-to-back penalties with just over two minutes left to play, but were successful in killing both, in large part to some big time saves by Scott, and a huge shot block by Parker Gavlas in the dying seconds. Medicine Hat was 1-for-5 on the power play, while Edmonton finished the game going 0-for-4 with the man advantage. James Hamblin (MH) (3), Andrei Pavlenko (EDM) (2), and Trey Fix-Wolansky (EDM) (1) were selected as Three Stars of the Game. Game 6 goes back in Medicine Hat on Sunday, March 31 for a 6:00 PM MT start.